Beyonce honoured Salt-N-Pepa at her cousin's costume birthday party on Saturday (29Oct16) by dressing up as a member of the rap icons. The superstar was among the guests at Angie Beyince's Halloween weekend bash, and she didn't disappoint as she channelled the look from the hip-hop group's Push It video, for the Eighties and Nineties-themed event. In a picture posted on Instagram, Beyonce is featured wearing a dark wig in the style of a bob, a colourful, rounded skull cap with an oversized jacket, and a thick gold chain around her neck, as she poses beside Sony Music executive Shawn Holiday, who attended the party as Prince in his Purple Rain heyday. "Happy 40th Birthday @angiebeyince #80's," Shawn captioned the image. "Prince & Queen @beyonce at #Angie#80's Bday (sic)." Beyonce's mother, Tina Knowles, also took part in the fun with her husband, actor Richard Lawson. Sharing a snap of the couple, she wrote, "At Angie's party. Such a fun party! Big fun in the 80s and 90s ! @richardlawson_rls my baby got his hi top fade". Another image featured Tina posing with birthday girl Angie, which she captioned, "Danced all night!! Great party but my feet hurt." Beyonce is known for her love of a good costume party - she hosted a Soul Train-themed gathering in New York for her 35th birthday in September (16) and stunned as Storm from X-Men at Ciara's 30th birthday costume party a year ago (15). 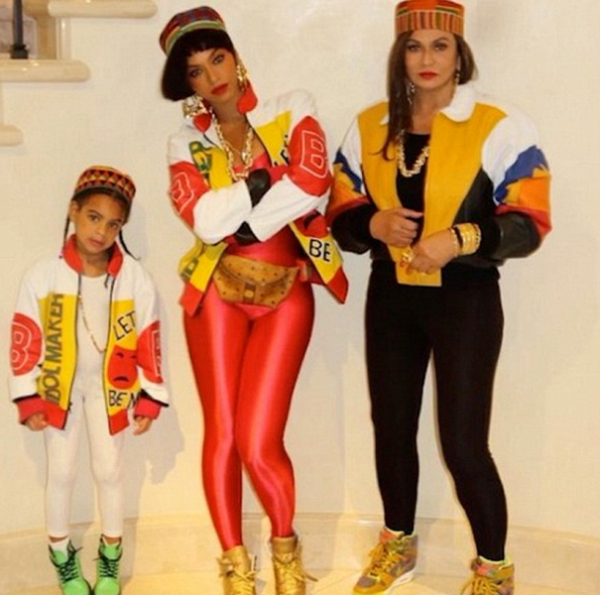 Her other Halloween outfits have also been impressive - in 2014, she dressed up as Janet Jackson alongside her daughter, Blue Ivy, who portrayed the King of Pop Michael Jackson for the night, and last year (15), the singer and her husband Jay Z drew inspiration from Eddie Murphy's classic comedy Coming to America, enjoying a night out as King Akeem Joffer and Queen Aoleon.